Take a trip in one of Malaysia’s most energetic cities! 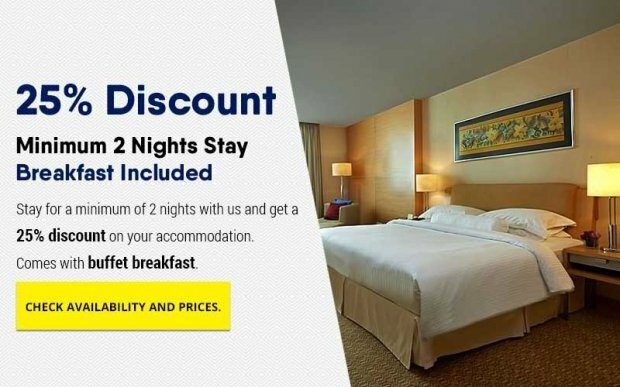 Book a minimum of 2 nights and get a 25% discount on your Kuala Lumpur accommodation. Instant confirmation is guaranteed! Prepayment: Only 8% prepayment is required to confirm your reservation. This is nonrefundable. The remaining balance shall be paid at the hotel. Modification: We don't charge you a modification fee if you choose to modify before 2:00PM, May 17, 2018 GMT +08:00. Extra Bed: Extra bed without breakfast MYR100.00 + 6% GST (RM106.00 nett). Extra bed with 1 breakfast MYR 120.00 + 6% GST (RM127.20 nett). Superior Queen,Deluxe Queen & Club Studio Rooms are unable to accomodate extra bed due to space limitation.